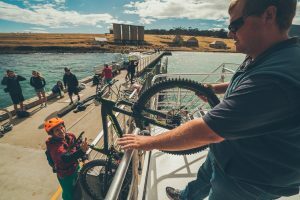 With 20 kms of dedicated mountain bike trails, plus a skills area featuring Australia's biggest pump and a jump track, Hollybank, just 20 minutes outside of Launceston, offers a lot for mountain bikers in Tasmania. Take a trip to Australia’s capital of MTB covered in wild mountain bike trails. 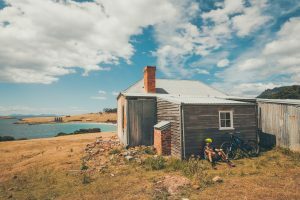 Tasmania is an epic place for mountain biking (MTB) with a variety of terrain conditions and trails for all fitness levels and ages. 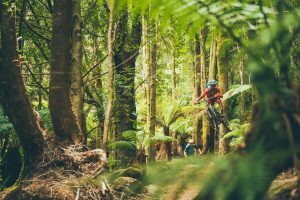 It has become Australia’s capital of MTB and a destination for world-class riders seeking adventure and dazzling scenery. 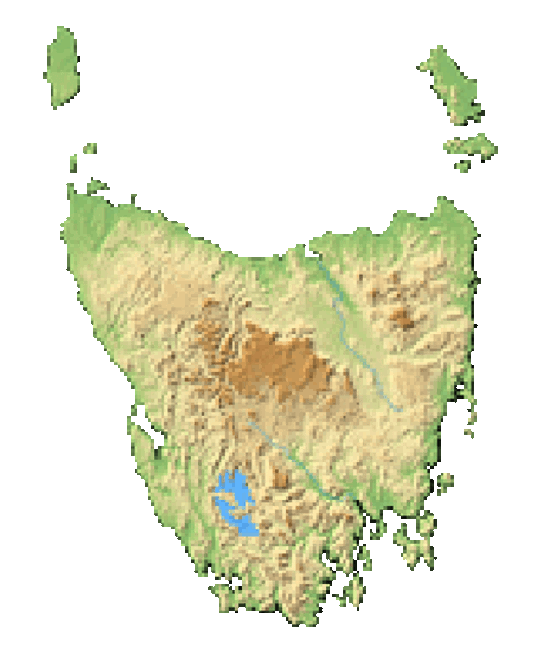 Parks are located throughout the state and many are within a relatively short distance from the major cities of Hobart and Launceston. Image thanks to Flow Mountain Bike. 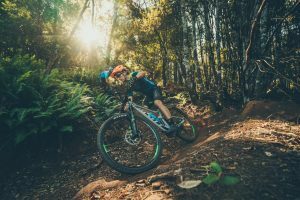 This network of trails surrounds the town of Derby, once a booming epicentre for tin mining, and now a top destination for MTB trailblazers across the globe that are looking for a challenge. This MTB mecca has everything going for it: a welcoming town and base, killer trails for all levels, breathtaking mountainous scenery, and even the cosy Weldborough Pub serving up local microbrews and hearty meals at the end of the popular Blue Tier trail. It is located just 90 minutes from Launceston in the northeast. This small, country town gained worldwide attention for hosting the Enduro World series in 2017, and is slated to do so again in 2019. Acclaimed, hand cut trails abound from 2017 (Trouty, Upper Shearpin, Detonate). These wild paths will take riders to new heights (literally). You can get to most of them by shuttling up to Black Stump, or, climbing. The Cascade Dam collapse in 1929 is the inspiration behind the Dam Busters trail (which also has a beer named after it). Ride along the bedrock through forest where the river used to be and then descend sharply to Derby. The Blue Tier trailhead can be reached by shuttle and promises to be an 18km adventure with awe-inspiring views and a joyful descent interspersed by small climbs. Glide by temperate rainforest and enjoy a visit to the pub where the trail finishes on the lower half of Big Chook. The Atlas trail is better suited for experienced riders and includes some technical features that are sure to enrapture the adventurous rider keen for something special. This wilderness trail is mostly descending and is known for the boulders midway through that create a natural obstacle course in the forest. This trail starts close to Weldborough and was originally the site of one of Derby’s famed mines, relics of which can still be found today underneath the moss. Image thanks to Flow Mountain Bike. It is recommended to stay at least a few days in Derby to fully experience all it has to offer. New trails are currently in development as its popularity grows worldwide. Other local activities to consider include a swim in the Ringarooma River or underneath Mathinna Falls, a taste of the Dam Busters brew at the Little Rivers Brewing Co. in Scottsdale, or a visit to the Derby Schoolhouse Museum to brush up on Australian history. 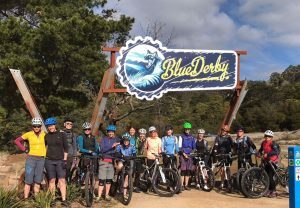 Just 80 minutes from Hobart in the Derwent Valley, MTB enthusiasts will relish a visit to the new and dynamic Maydena Bike Park. 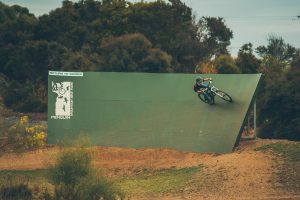 With more vertical of any park in Australia (820m) and massive jumps to boot, this park is creating waves in the MTB world and drawing in intermediate to advanced riders ready for something new. There are also some options for beginner riders. This full-service bike park features gravity trails galore, boasting gorgeous views of the World Heritage Wilderness Area from its 1100m summit and cafe. A ticket will allow visitors to make as many trips as they like from the summit, which they can reach by a year-round shuttle. A great variety of descent options await riders at the top, some hand-cut and some machine-built. Nature lovers will want to immerse themselves in their surroundings and pay a visit to Mount Field National Park, just 10 minutes away. Nearby Russell Falls is just one of the many natural wonders that can be visited on a walk through this pristine wilderness. This area is also known for beautiful walks, kayaking, and other outdoor adventures. 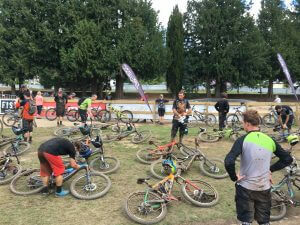 The Hollybank Mountain Bike Park is just 20 minutes northeast from Launceston and features 20km of dedicated mountain bike trails. A range of options exist for every level, from the thrilling Juggernaut track (10k descent), to the easy loops and wooden berms. Image thanks to Flow Mountain Bike. This national park is the perfect destination for anyone looking to get away from it all and enjoy the sights and sounds of a beautiful and remote wildlife sanctuary. Ideal for beginners, the 30km of tracks and trails around the island allow for a majestic journey where visitors are sure to come across stunning views of sea cliffs, historic ruins, and an array of wildlife such as wombats, kangaroos, or even a Cape Barren Goose. Although there are no cars or shops on the island, visitors can stay overnight at the Darlington Probation Station, a UNESCO World Heritage Site.Image thanks to Flow Mountain Bike. 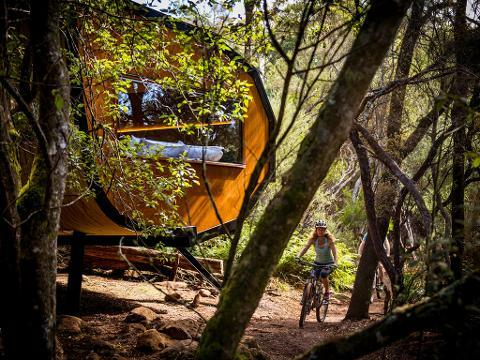 Although Penguin Mountain Bike Park offers just 4km in trails, it’s a unique experience for a rider, featuring creative wooden structures, some skills sections, and a disused asphalt speedway in the midst of it all. Dial Range will take riders on longer tracks with higher elevations on a mixture of trail types and wooden tramways. Image thanks to Flow Mountain Bike. To further explore the region, consider a trip to nearby Burnie, or head to Cradle Mountain for some more outdoor adventure. Several MTB trails exist in this remote region including Granville Harbour (Climies Track), Montezuma Track, Sterling Valley Track, Heemskirk Loop Track, and Spray Tunnel Track, with more in the works for the future. This region of Tasmania is renowned for its wild and rugged ways, so be prepared for unpredictable weather and breathtaking wilderness! For visitors staying in Hobart, multiple options close by include Mount Wellington, Glenorchy MTB Park and Clarence MTB Park. 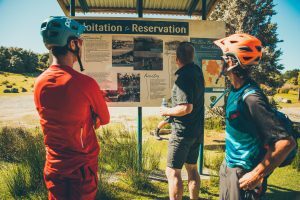 With Tasmania’s reputation as a world-class MTB destination strongly in place, the sky is the limit and multiple projects are currently in the works. 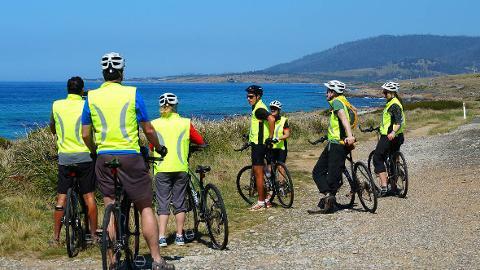 MTB enthusiasts pay close attention and be ready for some new trails calling you back to Tassie!